On the edge of a secluded valley, deep in the Dorset countryside, is Mapperton House, a Jacobean manor house, and home to the Earl and Countess of Sandwich. The house itself is only open for a few weeks during the summer, but the gardens are open from the beginning of March to the end of October and were the reason for our visit. 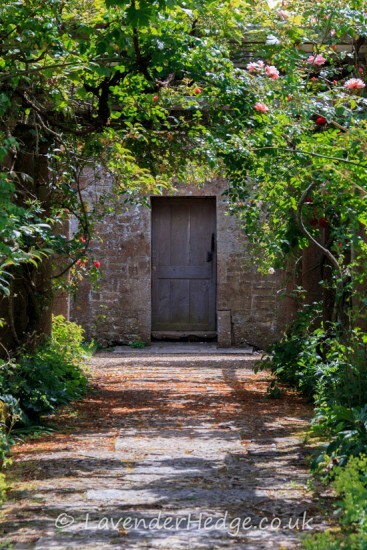 The gardens at Mapperton House have evolved over time and take advantage of the valley location, where they are set out on different levels. From the croquet lawn beside the house you can enjoy the stunning scenery, as well as a bird’s eye view of the first formal level of the garden. 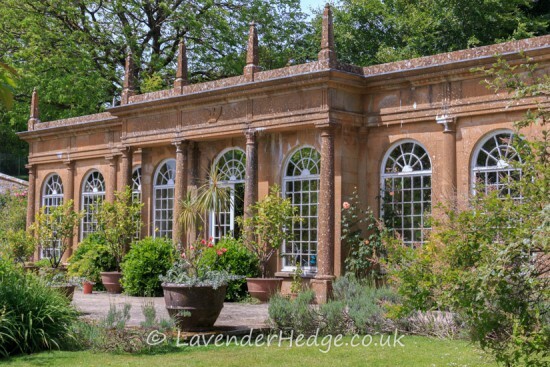 This Italianate style garden was designed in the 1920s and features a beautiful Orangery added in the 1960s. 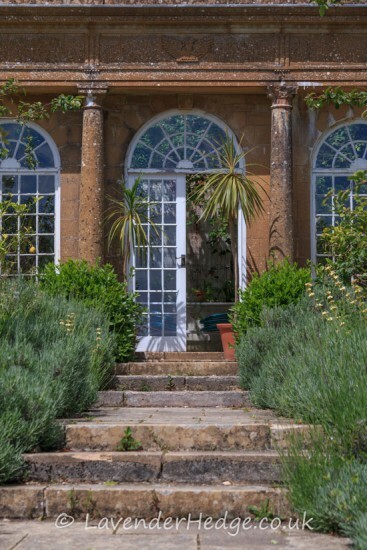 The Orangery is airy and filled with lush, tender plants, as well as orange and lemon trees in giant pots. 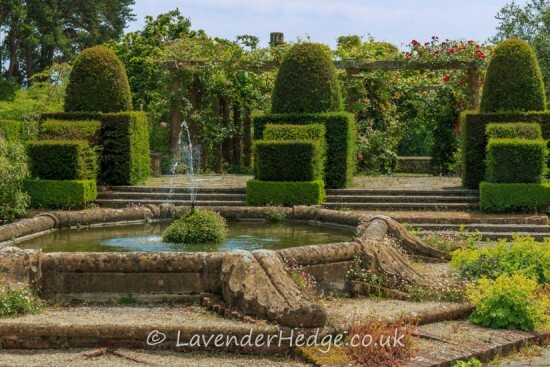 Wide stairways – framed by topiary, weathered stone urns and statues – lead to the central fountain. Alchemilla mollis, Campanula and Erigeron karvinskianus have self-seeded in the cracks and crevices, softening the formality without spoiling it. 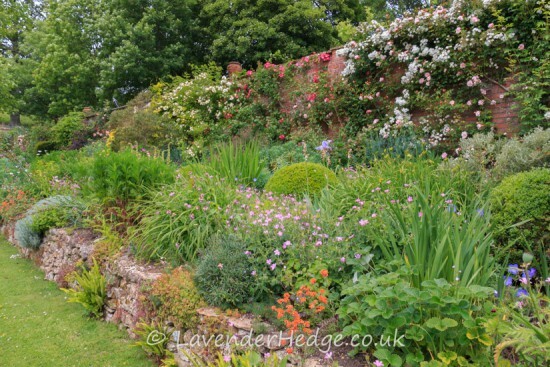 The high walls surrounding the garden and pergola are smothered with scented roses, whilst an herbaceous border provides colour and interest at ground level. 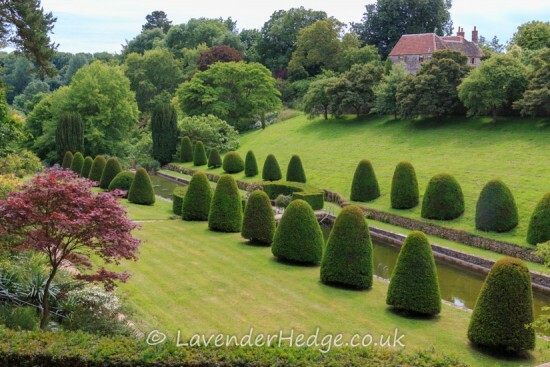 The next terrace is home to the old swimming pool, flanked by rows of neatly clipped yew trees. 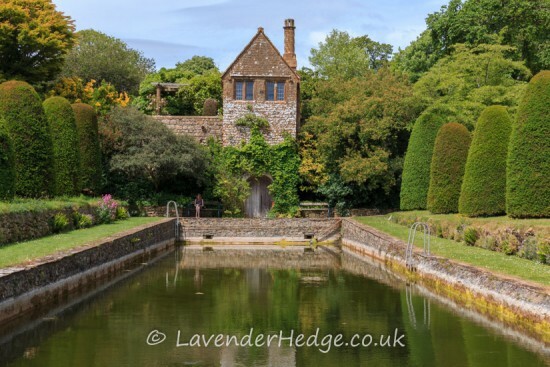 The pool is no longer used by people, but was teeming with newts and froglets at the time of our visit. Further down the garden is the lily pond. 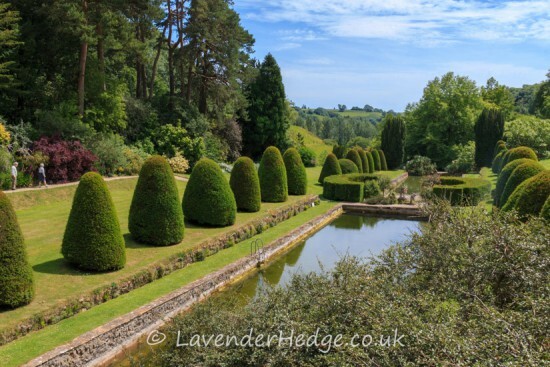 The shrubs and trees that surround the formal areas of Mapperton garden are beautiful and the view of the wider landscape is spectacular. 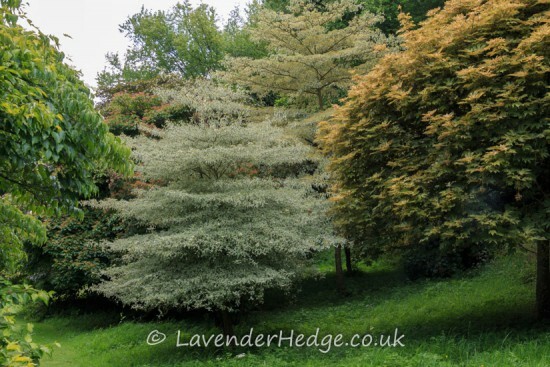 From the formal water gardens, you descend further into the valley with its hidden stream, edged with giant gunneras, into the arboretum which contains wonderful specimen trees and unusual shrubs. 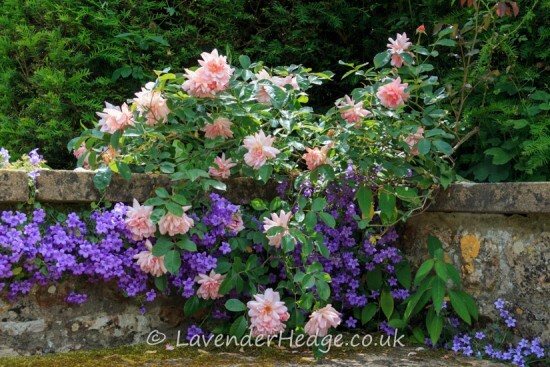 The Rhododendrons and azaleas had mostly finished flowering at the time of our visit, but a few flowers lingered. 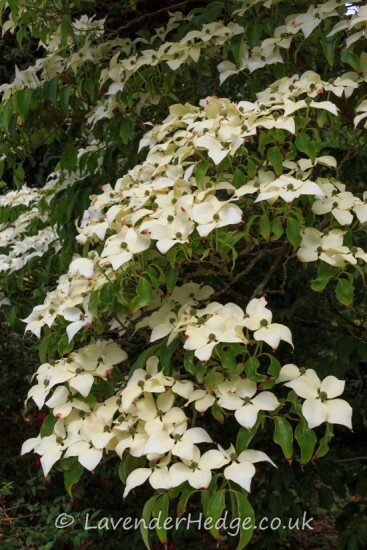 There are lots of Cornus varieties, including the ‘wedding cake tree’ and a beautiful Stuartia pseudocameilia with its fantastic peeling bark. A good sized specimen of Davidia involucrata, otherwise known as the Handkerchief tree, must have looked quite special with its fluttering white bracts (most of which had dropped by the time of our visit). 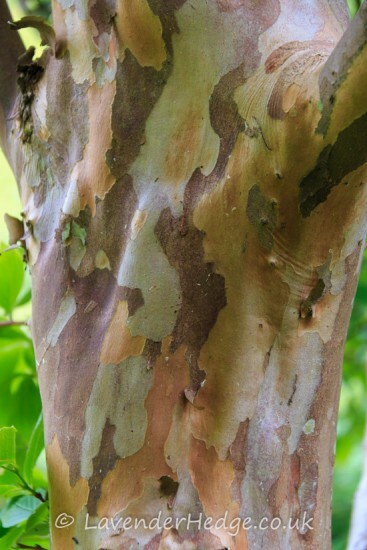 Almost all of the trees are named, which is always a bonus when visiting gardens. Secluded seating areas allow the visitor to enjoy the peace and quiet of this beautiful garden. 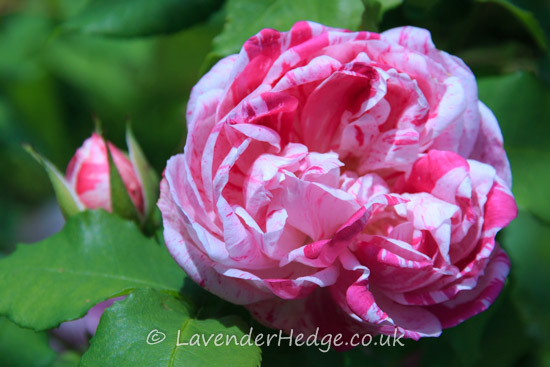 We visited Mapperton gardens at the end of June, which is a great time to enjoy the roses. However, this is definitely a garden worthy of visiting at different times of the year. In late spring/early summer the Magnolias and Rhododendrons would be flowering and I am sure the colours in the autumn must be fabulous. There is plant sales area where you can purchase some unusual plants at reasonable cost. 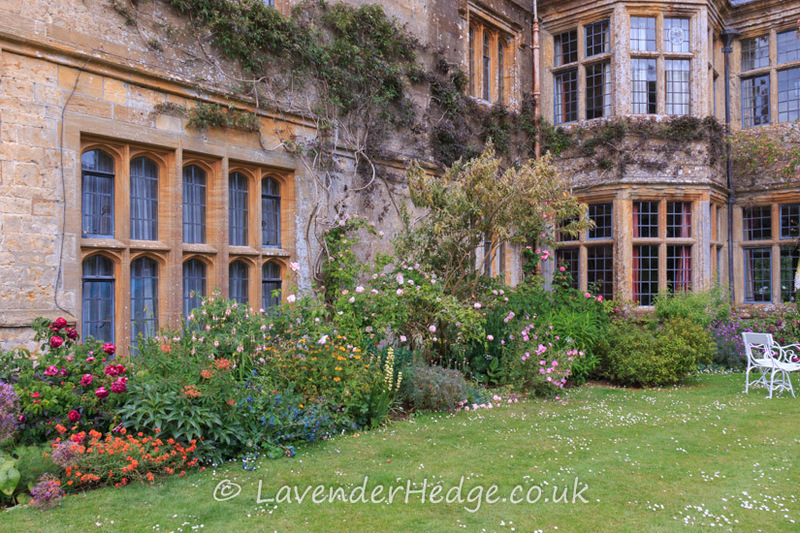 In June 2015, entry to garden was £6 per adult, which I felt was about right. Visit when the house is open and the combined entrance cost is £10. Thanks for the review, it looks amazing. 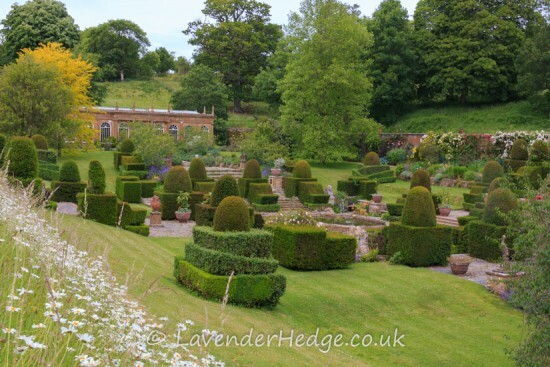 I am going to add this to my list of gardens to visit!